I've been working on my first shawl which is also my first lace project. This is the Shaped Triangle from "A Gathering of Lace". 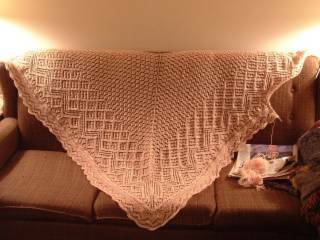 I grossly underestimated the size when I substituted yarns and needles, but it is beautiful. It was almost complete when I made a dreaded discovery.